Buddy, the charismatic brindle Boxer brought to the small screen by Toyota South Africa and its marketing partner of nearly half a centurys’ standing, Draftfcb Johannesburg, has featured in a few television commercials. These commercials are amongst the few that I really don’t mind watching – over and over and over again. Buddy is introduced to the South African public as a sophisticated, aristocratic beast of pedigree who disassocates himself with any lower form of life. 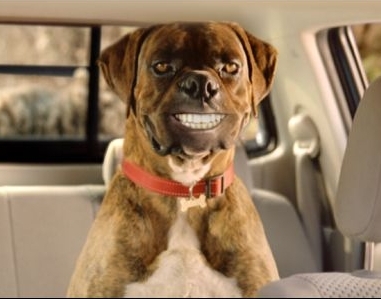 In this commercial the canine star is off to a dry Karoo farm for the Toyota Hilux. Buddy abandons any attempts to behave with sophistication and grace. Instead, he has fun on the farm mocking the sheep he encounters and making bad jokes, while recognising the Hilux’s toughness. This is my favourite “Buddy” commercial – “what a chop”! In this commercial he is on a game drive, once again pulling up his nose at the “lesser” elements of the animal kingdom. Here Buddy is strolling through a used car lot, quite adamant that he “doesn’t do tricks!! !”.